The Pennant-winged Nightjar (Semeiophorus or Macrodipteryx vexillarius) is a migratory African nightjar that occurs from Nigeria to northern South Africa. In Africa, it is mostly known as Wimpelvlerknaguil. It is related to the Standard-winged Nightjar with which it shares notable similarities in breeding strategies, roosting and feeding habits, as well as vocalizations. 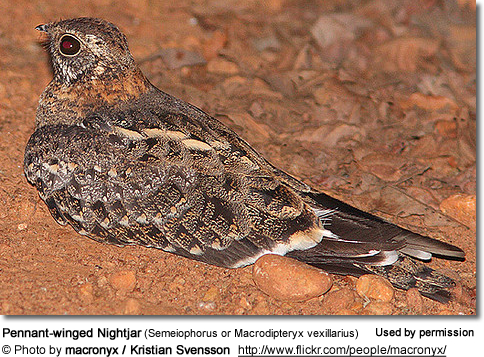 This nightjar is commonly heard within its range, but less often seen - due to its nocturnal habits. 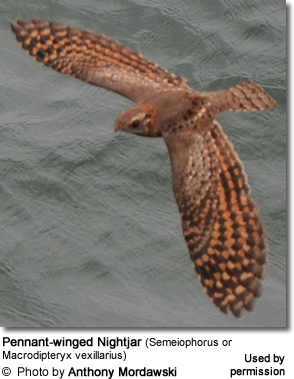 Its brown-mottled plumage keeps it well camouflaged during the day, when it is also usually hidden away sleeping. Their cryptic appearance blends perfectly into their woodsy habitat; hence they are very difficult to spot during the daytime, when they are generally hidden away sleeping. They are most easily detected at night when light from car headlights are reflected red from their eyes, as they are sitting on tracks or roads. However, their presence is most often made known by their loud calls given at dusk. The Pennant-winged Nightjar's range includes central, northeastern and eastern Angola, southern Democratic Republic of the Congo, and southwestern Tanzania, south to northeastern Botswana, northeastern Namibia (Caprivi Strip) and extreme northeastern South Africa. They winter from southeastern Nigeria to Uganda. Within its natural range, they are usually observed alone. Non-breeding habitat: subtropical savanna from Nigeria to Sudan. 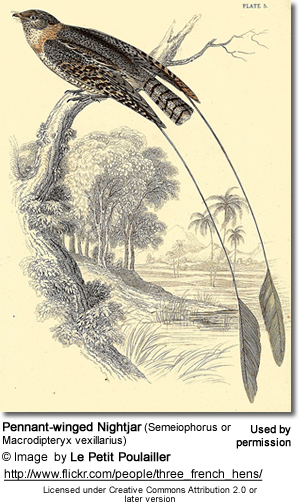 The Pennant-winged Nightjar has a height of about 11 inches (27 cm) and weighs around 2.5 oz or 70 g, which is about the size of a starling. The head and its bill are black-colored. The eyes and the legs are brown. The throat is white and the back is black. The male can be easily identified from the female by the broad white band over the otherwise black primaries (the longest wing feathers). Males also grow a 9th primary feather on each side of the wing during the breeding season, which will grow longer as he matures - up to twice his body length (please refer to image below). These elongated feathers look like pennants (narrow, tapering flags) -- and this species has been named for this physical trait. However, these "pennants" often fall off, or are broken off, after the breeding season. Most nesting activities occur from spring to early summer south of the equator. After the breeding season (mid-summer), they usually return to the northern hemisphere. The male establishes his breeding his territory and attracts the attention of females with an insect-like song, and he performs a display flight, wherein receptive females will join in. 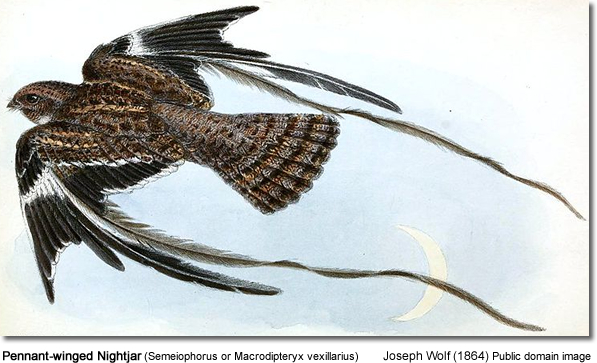 Pennant-winged Nightjars are bigamous -- meaning they will take on more than a single mate. The female may lay one to two eggs (mostly two) that are reddish creamy / pinkish in color, with brown and spots or blotches.